We’re a site that creates a variety of exclusive modern international and American history content! We create free history audio podcasts as part of History in 28-minutes, a magazine called History is Now, and books as part of Required History. Our works explain some of history's most important events concisely and quickly. We've created podcast series on the Cold War, the American Revolution and the Spanish Civil War among others to date. We've also released short books to go with these series. And our latest project is History is Now magazine - click the magazine image to find out more! Oh and our blog is expanding all the time too so take a look at it! History is Now Magazine is our fascinating history magazine. Note: We have temporarily suspended publication of the magazine; however we will return! We'll be sure to let you know when we're publishing again. We are the home of the 28-minute history audio podcast and produce the podcast 'History in 28-minutes'. If you haven't heard any podcasts yet, we're sure that George Levrier-Jones's captivating style will have you addicted to our podcasts as soon as you start listening! You can access all of our podcasts on our rss feed or in iTunes. More episode and listening information is available on our blog and history podcasts page. And don't forget to join the site to find out about our latest news and free book releases.. Happy listening! A few of our podcasts..
Our digital magazine, History is Now, brings you some of the best articles on topics in International, American and European Modern History. The focus of the magazine is on the 19th century, 20th century, colonialism, communism, and civil war. It is available on iPad, iPhone and Android ( the latter very soon!). Click here to access our magazine page. We produce books as part of the 'Required History' series to go alongside our podcasts. The aim of the series is to create approachable, succinct written introductions to some of the most interesting topics in history. They also allow the reader to learn about the events we look at in the podcasts in more depth. Click here to access our books page. Our Cold War history and Cold War People podcasts look at the ever intriguing Cold War events over nearly half a century. We look at the Vietnam War, arms race, Korean War, Cuban Missile Crisis, Prague Spring, and the Reagan years amongst a wide range of events. And Cold War People looks at the lives of people involved in the war. Kennedy, Churchill, Stalin, Mao, and Truman are a selection of the people we have looked at so far. And there are more to come in the future! Click here to access our Cold War page. 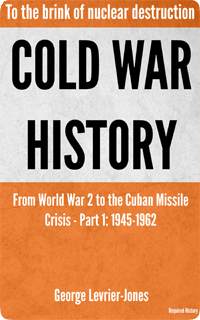 And click the buy now button to grab a copy of our latest Cold War book! The American Revolution changed history. It gave Americans their liberty. It inspired other revolutions. And it brought a new and very powerful country in to the world. In our podcast series we look at how the American Revolutionary War or the American War of Independence started, progressed and finished. Click here to access our American Revolution page. Our series on the Spanish Ciivil War looks at the war that tore Spain and Europe apart. It considers the events that led to Spain's Great War, and how the Great Powers of Europe played such a major role in it. The Spanish Civil War was so much more than just a domestic conflict. It involved battles between Communism and Fascism, Germany and the USSR. In short, it is of vital importance in understanding not just Spanish history, but also World War 2. Click here to access our Spanish Civil War page. And click the buy now button to grab a copy of our related book! Simply put your email in the box below, click Join Our World and then check your Inbox! Now close the window and enjoy the site!